Imagine walking into a shoe store only to find one size of shoes available for sale, and it’s not yours! Even if there are multiple styles to choose from, it’s highly unlikely that you will return. After all, you received the message loud and clear: YOU don’t belong here. And that reveals the challenge for businesses when it comes to engaging Latino consumers. Companies must understand that one size marketing does not fit all, because Latino consumers do not comprise one homogenous unit. Miss the mark and the door to this growing market closes. So it is imperative that sales and marketing directors gain accurate insights into this multi-faceted market if they want to bridge the divide and drive meaningful and relevant interactions with their brand. To grasp what’s relevant, businesses must first understand the diverse nuances amongst U.S. Latino consumers. Various combinations of factors are at play: Demographics. Generation. Country of origin. Cultural history. Extent of tech adoption, and more. Relationships begin with an interest in, and understanding of, where people are coming from, what matters to them, and who they want to be. Sometimes, instead of speaking TO and WITH Latino consumers, businesses speak AT them. Whether advertising inadvertently reinforces inaccurate portrayals or uses vocabulary that unintentionally offends, the end result for a company is a missed opportunity or, worse, lasting damage to the perception of its brand. When you have seconds to make an impression, relevance is even more critical. Brands MUST know their audience across the dimensions or they’ll fail to hit the mark. Then, instead of selling TO them, they must proactively engage with relevance – sending the right message, on the right device, at the right time. MOST BUSINESSES GET ONE SHOT TO IMPRESS LATINO CONSUMERS. DON’T WASTE YOURS! Hispanic spending power, household income, and the share of U.S. population Hispanic consumers comprise, is on the rise. Do you know how to reach and welcome your specific target segment of the Latino consumer market? You could troubleshoot and find your own way. OR you could save time and frustration by reaching out to an agency of specialists familiar with your customers and the language of your target demographic. There’s no better time than now to touch base with, and bring your challenges to, the specialists in connecting brands with Latino consumers. Contact Posada Media to start the conversation today. 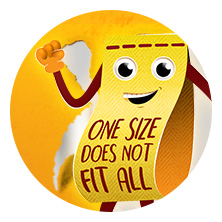 Experience the benefits of moving beyond a one size fits all approach!